Questions have arisen recently about the role of spiritual wellbeing in strengthening resilience of youth. To explore this association, this case study focused on the relationships and connectedness of young people who attend one religious organisation as one means of enhancing their spiritual wellbeing. In line with the purposes of an instrumental case study, different sources of data (quantitative and qualitative) were collected on the phenomenon of interest—spiritual wellbeing. A theoretical purposive sample of sixty-five people participated in the study. A mixed methods research approach guided this case study, which incorporated both single and multicase study techniques. Through an abductive analysis process, spiritual wellbeing and resilience were shown to be interrelated and ecologically bound. 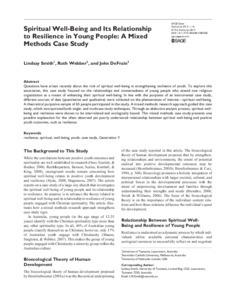 This mixed methods case study presents one possible explanation for the often observed yet poorly understood relationship between spiritual wellbeing and positive youth outcomes, such as resilience.